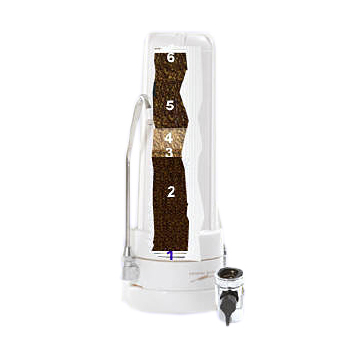 Arsenic Water Filter Countertop by Crystal Quest is a single cartridge system with 7 stages of filtration. Available in White or Stainless. 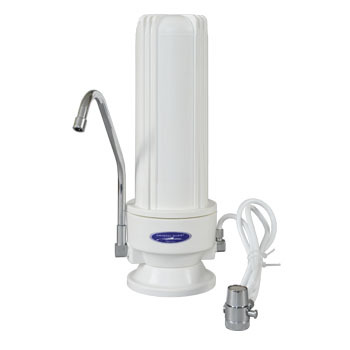 The cartridge follows the standard multistage filtration process embedded with a layer of a proprietary media specifically designed for selective removal of arsenic from water, certified to NSF/ANSI 61 Standard. Uses highly porous anion resin is impregnated with iron oxide to allow for fast and efficient adsorption of arsenic. The added combination of Coconut Shell Carbon or Granulated Activated Carbon(GAC) and Eagle Redox Alloy media layers increases the systems' effectivity in removing hundreds of other contaminants from your tap water. 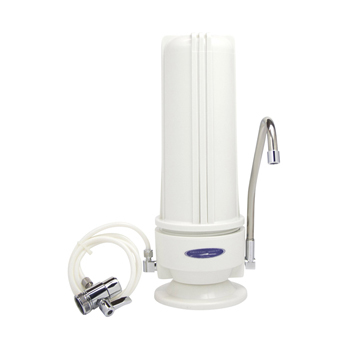 Counter-top water filter systems installs in seconds and sits on the countertop for water on demand and an easy option to choose between filtered and unfiltered water in one switch. If your arsenic level is very high, above 30 - 40 ppb ( 0.03 - 0.04 mg/L ), we suggest going with a dual cartridge system, and at higher than 50 ppb levels with a Triple arsenic removal system. At levels significantly over 50 ppb (0.05 mg/L) consider triple countertop or triple under sink arsenic removal system with TWO arsenic filters (you will have to order an extra arsenic filter and replace the first carbon cartridge with it) for 4x arenic removal capacity. Single cartridge, multi stage system. 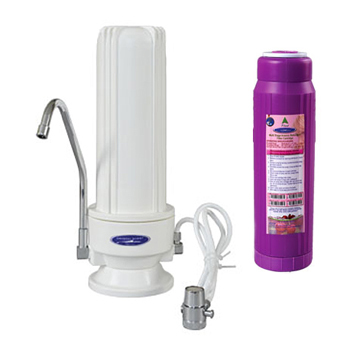 Effectively removes Arsenic and many contaminants from water. Combined with Coconut Shell Carbon(GAC) and KDF media for cancer linked chemicals and heavy metals. Diverter valve allows easy switch between filtered and unfiltered water. Sits on the counter and easily connects to any kitchen faucet. - This counter top system installs in minutes and sits on the counter for pure water on demand. - Available in White BPA-Free plastic or Stainless Steel.